Contact Us to Book! Get in touch to book your package. This Australian owned beachfront resort provides a peaceful retreat after your daily scuba diving, snorkeling and trekking activities. Located approximately 40 minutes drive south of the city of Kota Kinabalu on the west coast of Sabah, families, couples and singles alike enjoy great ocean views of the South China Sea from the resort. An outdoor swimming pool, a library, mini golf green and a restaurant with friendly Australian and Asian hospitality makes this a truly great gateway. Resort offers comfy chalets and all with private verandahs facing a pool and tropical garden, approximately 100 meters from the sea. The only down side with this location is the drive to the marina and back (our daily meeting point) for your day trip activities. We find, however, that guests do not mind the journey as the resort location more than makes up for this small inconvenience. 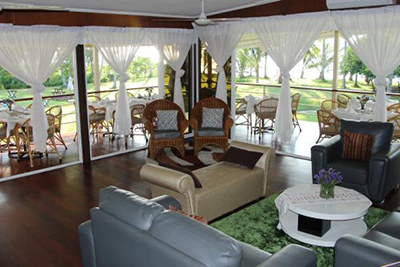 Required transfers from Langkah Syabas Beach Resort to Sutera Harbour Marina are also included. Based on Gaya island within the Tunku Abdul Rahman National Park and only 8 minutes from central Kota Kinabalu, our PADI 5 Star IDC Dive & Adventure Center is the perfect location for marine & wildlife lovers. This is where we surface interval and take our lunch breaks. 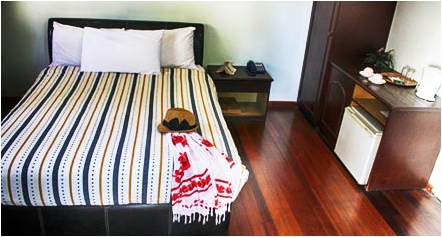 You will also have time to look around, its very peaceful and surrounded by primary rain-forest with lots of wildlife. 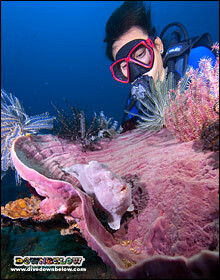 All dive sites are within a a few minutes from our centre. Scuba diving, snorkeling and trekking is superb and not crowded. Prices are based on Scuba divers – qualified and non qualified. However if Scuba diving does not appeal, then you can take the fully guided Snorkeling and Trekking Programs and pay the non-diver (ND) price, which is also stated below. Rates – based on 2 people sharing and valid until 31st March 2016. Daily return transfers to our meeting point are also included. Peak Season & Single supplement surcharges apply. Peak Season: Dec 2015 – Jan 2016. Please contact us for a quick response to your enquiry. Our international staff team provide premier 5 Star service, which is to be expected from a 5 Star Instructor Training Centre. We pride ourselves on very small group tuition providing a very personal service and have extremely high safety standards and procedures. The Downbelow Dive Shop & Travel Centre is based in KK Times Square in Kota Kinabalu, so please feel free to drop in – we offer free wireless Internet, tea, coffee and biscuits.